The Games are FINALLY here, and I’m so excited! Did you miss out on the Opening Ceremony? You can still watch the entire presentation on the CBC website. Look at how magical the Opening Ceremony was! Image source. The Opening Ceremony was just the beginning, however, and there are many important dates to be mindful of — including some that will have a short-term effect on York University’s Keele Campus (lane closures, yes, but also much more excitement around the Pan Am Stadium [YOR], the Canadian Tennis Centre [CTC] and Tait McKenzie Centre). Let’s take a look at some dates! Feel free to bookmark this resource, so that you can focus on the fun of the Games from here on out. If you have any questions about the dates listed, or you just want to talk about the Games with me, make sure to comment below or tweet @yorkustudents. 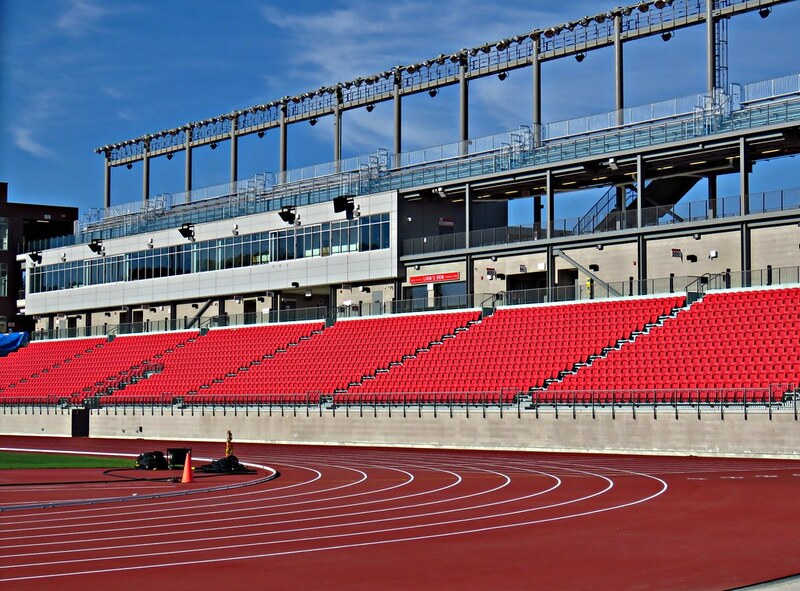 July 21 to 25 for Athletics events (at the CIBC Pan Am Stadium, or as we know it, the Toronto Track & Field Centre). It’s going to be so nice to see the stadium filled up with people! Image source. You probably remember me mentioning an arts and culture festival a few times, no? Called PANAMANIA, it aims to be the perfect complement to the athletic side of the Games. For 35 days between July 10 and August 12, enjoy free (!) music, art installations, delicious food and other fun activities. If you’ve been following this blog, you will know that my coworker, Sam, outlined the musical performance schedule for your convenience. You can find the rest of the performances and exhibitions on the Toronto 2015 website, but I’ll give a brief overview of when and where you can celebrate below. PANAMANIA Live at Nathan Phillips Square, including more than 130 musical acts on three stages. Daily from July 10 to 26 and August 7 to 12. CIBC Pan Am Park (Harbourfront Centre) Where Art Meets Sport, including two stages for live music and roaming performances. Daily from July 11 to 25. Check out this amazing concept art of the CIBC Pan Am Park. PANAMANIA is going to be so fun! Image source. PANAMANIA Live at the Distillery District, where you can enjoy the beauty of the cultures of the Americas as well as ticketed PANAMANIA events at the Young Centre for the Performing Arts. Daily (excluding Mondays) from July 11 to 25. The Games are bringing fun, excitement and some fierce athleticism to Toronto, but these go along with some possibly less fun, though definitely temporary and fairly minor, side effects like road closures or more traffic. Drivers among you, take a peek below for dates related to parking and road restrictions on the campus. Remember that you can avoid or minimize these inconveniences by using the TTC. If only parking was this fun 😉 Image source. Parking — the following lots will not be available for the times stated. If you have accessibility concerns, please contact Parking Services at 416-736-5335. Last but certainly not least, remember that York students also have a summer reading week from July 21 to 24. Some of our York athletes will competing on these dates — instead of going to class, you could always come out and support our Lions! Khamica Bingham, Daniel Novia and Dontae Richards-Kwok will all be competing at the CIBC Pan Am Stadium — find their competition dates in my #YUPride for Our Pan Am Lions post. Don’t forget, if you are looking for more information on the Games, to check out York’s Pan Am website at panam2015.info.yorku.ca!